Rockwell Collins, Inc.’s COL Government Systems business division recently won a $288.5-million modification contract for the manufacture and delivery of the AN/ARC-210 radio equipment systems. The deal will cater to the U.S. Navy, Air Force, Marine Corps and Foreign Military Sales customers. The contract was awarded by the Naval Air Warfare Center Aircraft Division, Patuxent River, MD. Work related to the contract will be performed in Cedar Rapids, IA, and is expected to get completed in September 2021. What is AN/ARC-210 Digital Communication System? The AN/ARC-210 Gen5 programmable digital communication system is a V/UHF powered integrated communications system that provides multimode voice and data communications in normal, secure or jam-resistant modes via line-of-sight (LOS) or satellite communication (SATCOM) links. Additionally, it provides embedded software programmable cryptography for secure communications and helps in creating high-speed communication of critical situational awareness information for increased mission effectiveness. The ARC-210 aircraft radio also provides VHF close air support radio communications on 30-88 MHz (megahertz) frequencies, navigation on 108-118 MHz, air traffic control on 118-137 MHz, land mobile communications on 137-156 MHz and maritime communications on 156-174 MHz. The company’s Government Systems division reported sales of $654 million in the fiscal third quarter, subsequently generating a solid year-over-year revenue growth of 16%, driven by higher communication and navigation sales. This division’s communication and navigation sales increased by $25 million due to higher thermal and electronics sales, and higher test and training range sales. Considering the latest contract win, we may expect the Government Systems unit to reflect similar solid performance in the upcoming quarterly result as well. Furthermore, the acquisition of Rockwell Collins by United Technologies Corporation is expected to clear the way for the former to capitalize on connected aircraft, which can additionally broadcast sophisticated data regarding onboard systems, routes and weather, facilitating airlines to develop operations and maintenance. Moreover, Rockwell Collins made some notable accomplishments in the third quarter, pertaining to its digital communication systems. One of them was the selection of its UrgentLink disaster communications network system by the Los Angeles County Sheriff’s Department, which would help in providing a countywide backup communications system for use during man-made or natural disasters. Considering these recent developments, we may expect the company to reflect more growth in its communication and navigation business unit. Rockwell Collins’ stock improved about only 11.3% in the last year compared with the industry’s growth of 20%. The underperformance may have been caused by the intense competition that the company faces along with high exposure to fixed-price contracts. 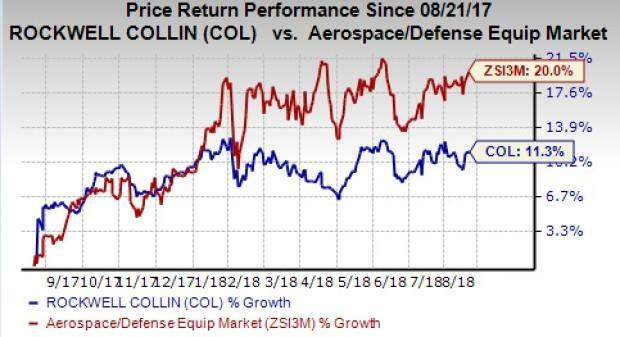 Rockwell Collins currently carries a Zacks Rank #4 (Sell). A few top-ranked stocks from the same sector are Aerojet Rocketdyne Holdings AJRD, Engility Holdings EGL and Huntington Ingalls Industries HII.